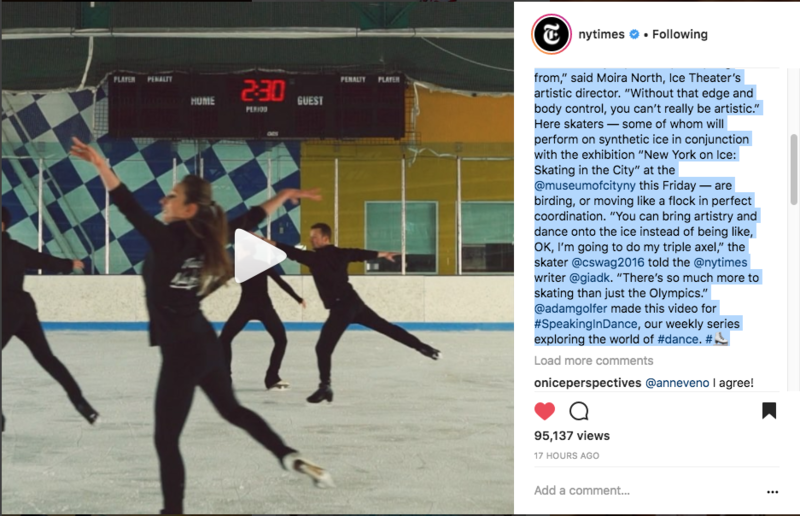 nytimes #SpeakingInDance “We’ve all developed a big sensitivity with our connection to the ice, but being in a group we also develop a sensitivity to each other,” said @joeldear, a skater with @icetheatreofny. “You pick up the nuances and the energy of the people around you.” This may look like a performance, but it’s actually Ice Theater’s company class. Known as plié power, it’s held most Tuesdays at @chelseapiersnyc and is open to all. Created by the British skater #JohnCurry, the class emphasizes edge work, in which the skater glides on an inside or outside edge of the blade to find “that solid base is where the jumps and spins spring from,” said Moira North, Ice Theater’s artistic director. “Without that edge and body control, you can’t really be artistic.” Here skaters — some of whom will perform on synthetic ice in conjunction with the exhibition “New York on Ice: Skating in the City” at the @museumofcityny this Friday — are birding, or moving like a flock in perfect coordination. “You can bring artistry and dance onto the ice instead of being like, OK, I’m going to do my triple axel,” the skater @cswag2016 told the @nytimeswriter @giadk. “There’s so much more to skating than just the Olympics.” @adamgolfer made this video for #SpeakingInDance, our weekly series exploring the world of #dance.